1. The act or process of making something louder: "Lina liked to play her music without much amplification." 2. The production of an output of greater magnitude than the input: "An amplification can be the act or process of making something larger, greater, or stronger." "The excessive amplification of the concert ruined the concert for most of the audience." 3. In electronics, an increase in the magnitude of a signal: "Tamika was having trouble trying to produce more amplification with her portable radio because of the old batteries. 4. A detail, explanation, or illustration added to a spoken or written account to make it fuller or to clarify it: "The coach explained that the new rules for basketball will need more amplifications; so, he started the meeting with an amplification of those issues." "The editorial in the newspaper criticized the continual amplification of federal control over those of the states." 1. Something that enlarges, or extends: "In electronics, an amplifier uses transistors or electron tubes, which produce an increase of electrical signals. 3. A device that makes sounds louder: "Some amplifiers increase the sound levels of musical instruments." 4. An electronic device that intensifies the magnitude of weak input signals, voltages, or electric currents without changing the characteristics of the waveforms of those signals: "Amplifiers are used in radio and television receivers and in stereophonic sound systems." "In engineering, amplifiers are used to increase the magnitude of some physical or mechanical devices." 1. To make larger or more powerful; to increase: "The administrator must amplify his efforts to get his staff to produce better results." "The microphone amplified the singer's voice." "The psychologist maintains that technology exists to complement and to amplify the human mind." "The amplified music was so loud that Jim couldn't hear what Trudy was saying." 2. To add to, as with illustrations; to make complete: "The speaker was asked to amplify his remarks by giving the audience some examples." 3. To exaggerate: "The radio talk-show host always amplifies the evils of his political opposition and minimizes any negative aspects of his preferred political group." 4. To increase electrical signals: "The technician was working to amplify the transmission, storage, and manipulation of information for the company's computers." 1. An object produced or shaped by human craft, especially a tool, weapon, or ornament of archaeological or historical interest: The archaeologist found a cave which had many prehistoric artifacts in it. 2. Something that appears to exist because of the way an object or data is examined: Sam's behavior presented an artifact of his abnormal relations with other people. 3. A structure or feature not normally present but visible as a result of an external agent or action: The decline in the high school test scores was obviously an artifact of the way the test was administered to the students. 4. 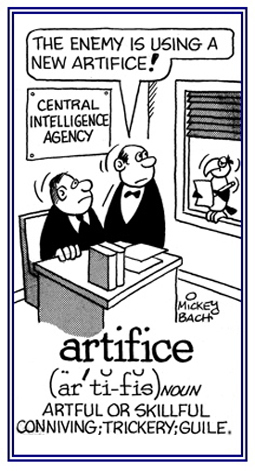 An inaccurate observation, effect, or result; especially, one resulting from the technology used in scientific investigation or from an experimental error: The pattern in the data which was presented by the government agency was an artifact of the incompetent way it was collected. © ALL rights are reserved. 1. 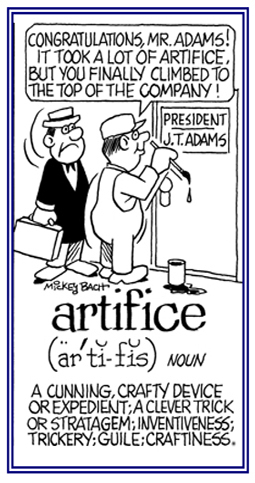 An artful or crafty device; a stratagem: The artifice used by the salesman was intended to trick and to ensnare other people into buying his products. 2. A subtle but base deception; trickery: Ben's story was just an artifice to win sympathy from his colleagues. 3. Cleverness or skill; ingenuity: People need artifices to get others to participate in certain activities or to do something. 4. 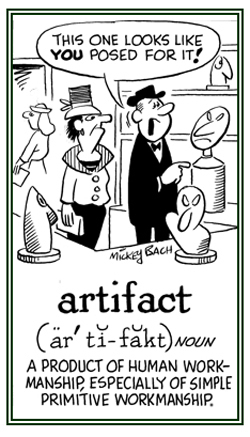 Etymology: borrowed from Old French meaning "craftsmanship"; from Latin artificium, "trade, craft"; from artifex, "craftsman". A compound construction from ar(t)s, "art, craft" +-fex, fic-, "maker" from facere, "to make". 1. Someone who is the first to think of or to make something. 2. A person who is skillful or clever in devising ways of making things; an inventor. 3. A skilled worker who practices some trade or handicraft. 1. Made by human skill; produced by humans; as, opposed to natural origins; such as, artificial flowers. 2. Imitation; simulated; sham: "Barbara used artificial vanilla flavoring when baking her cake." 3. Lacking naturalness or spontaneity; forced; contrived; feigned: "Sally greeted us with an artificial smile." 4. Full of affectation; affected; stilted; for example, artificial manners, artificial speech. 5. Made without regard to the particular needs of a situation, person, etc. ; imposed arbitrarily; unnatural: "Jack thought the club presented artificial rules for membership." 6. Based on arbitrary, superficial characteristics rather than natural, organic relationships: "The botanists presented an artificial system of classification for the plants." 7. Manufactured to resemble a natural gem in jewelry, with chemical composition, and appearance. 1. A deep stupor or unconsciousness and reduced organic activity resembling the natural state of motionless exhibited by certain animal species during winter: One use of artificial hibernation is the therapeutically produced medical condition that is caused by the use of drugs alone or drugs and hypothermia which greatly reduces the metabolic state (body activities) during surgical procedures; such as, open heart surgery. 2. The act of retiring into quiescence: The author emerged from his artificial hibernation to produce his first book after several years. 3. A condition of the retarded vital activity of an organism in warm-blooded animals, including humans, which is created in a simulated way, similar to the condition of an organism during the winter: Artificial hibernation can be created through nerve-blocking techniques which stop the neural and endocrine mechanisms of bodily thermoregulation or heat regulation. 1. Not according to nature; not genuine or natural. 2. Not by natural means: "The report consisted of artificially induced conditions." 3. Made in imitation of something natural; simulated: "Bill had artificial teeth in his mouth." 1. Contrived by art rather than by nature. 2. Not arising from natural growth or characterized by vital processes. 1. Reinfection by an organism existing within the body or transferred from one part of the body to another. 2. The direct reinfection of a host individual by larval offspring of an existing parasite. Showing page 2 out of 42 pages of 624 main-word entries or main-word-entry groups.